May the Best Pet win is the new My Little Pony: Friendship is Magic DVD which is out now to buy. This is the second DVD in series 2 of My Little Pony : Friendship is magic and my two girls have absolutely loved watching it; Lara is a big My Little Pony fan but she doesn't get much opportunity to watch the Friendship is Magic series on TV so this has been a little luxury for her. 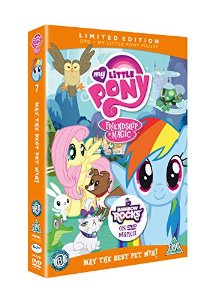 May the Best Pet win is a DVD which features 5 episodes of My Little Pony: Friendship is Magic and the DVD gets its title from the first episode in which Rainbow Dash hosts a competition to try to find her new pet. Lara is now of an age where she really understands the morals behind children's TV stories and explained to me that the reason why Rainbow dash chose her new pet was because they stuck with her when disaster struck (she got caught in an avalanche during the race... love my little girl for understanding this. Every My Little Pony episode has a clear moral behind it but the topics are still fun. Other episodes include Sweet and Elite (in which Rarity risks her friendships by socialising with a group of elite ponies) and Secret of My Excess in which the pony's friend Spike over indulges and regrets it. There are lots of fun stories, songs and new characters to meet. May the Best Pet Win is out now on DVD and there is a special edition boxed DVD available which also includes a My Little Pony Toy (this, in Lara's eyes, was the coolest thing... EVER).